On Oct. 7, 26 students from the College of Agriculture and Life Sciences (CALS) and College of Human Ecology (CHE) gave one-minute “lightning” presentations on topics ranging from helping New York farmers adapt to climate change to market testing alternative sap products and offering classes to second-time parents. 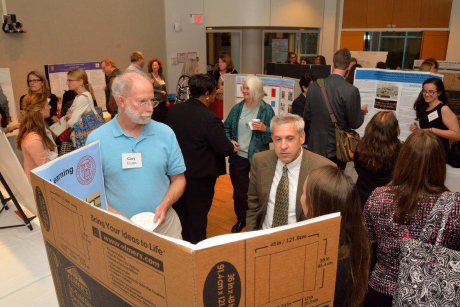 The presentations were followed by a poster session that outlined what the students learned through research conducted during the Cornell Cooperative Extension Summer Internship Program. 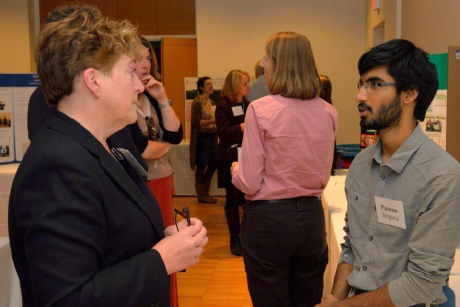 Pawan Angara ’16 conducted research on spotted wing drosophila, an invasive species that lays its eggs in otherwise viable fruit, creating significant losses for organic farmers in the Hudson Valley. Angara spent his summer developing a gel that attracted the insects to a location where they could be exterminated. This was his second summer participating in the program. “Every year I see more and more people doing great things for the community and great things for the world through research,” he said. Lindsay Dower ’15 updated a curriculum on nutrition and fitness and taught modules to middle school children in Canandaigua. Applying the research of Valerie Reyna, professor of human development, Dower tested a theory that learning by understanding overarching ideas is more effective than memorizing facts. “I learned so much about the research process and, beyond that, how to work with different groups and types of people … and I definitely strengthened my leadership skills,” Dower said. She is continuing her research in Reyna’s Laboratory for Rational Decision Making this academic year. Food science major Susana Jimenez ’15 spent her summer in Wayne County working to increase participation of traditionally underrepresented Latino children in local educational opportunities. Building on the research of CHE senior lecturer Pilar Parra, Jimenez conducted interviews and focus groups and learned that parents and caregivers in the rural area showed high interest in extension programs. She identified and evaluated sites, learning that hosting programs in familiar spaces with established community leaders, such as Catholic churches, increased program participation. She said these groups wanted to learn about nutrition and food safety, but they were open to many of kinds of programs. “It’s not so much what you teach, but where and how,” she said. Since its establishment in 2007, the Cornell Cooperative Extension Summer Internship Program has expanded from five student projects to 26. Caitlin Harder is a writer intern for Cornell Cooperative Extension. Posted in Students in the News and tagged cooperative extension, obesity, translational research on October 21, 2014 by ktb1@cornell.edu. By age 2, poor children have gained more weight than those who are better off. But after age 2, neighborhood poverty, not family poverty, puts the pounds on, finds a new study, published in the Journal of Applied Developmental Psychology (35:3). About one-third of America’s children are overweight or obese, but rates are highest among poor and minority children. The study identifies for the first time the effects of neighborhood-level poverty, family poverty and ethnicity on children’s weight, shedding new light on the origins of adult health disparities, the authors say. “The effects of neighborhood poverty on children’s weight may be just as important as the effects of family poverty,” says Cornell’s Gary W. Evans, the Elizabeth Lee Vincent Professor of Human Ecology, who co-authored the study with Pamela Klebanov, Princeton University, and Jeanne Brooks-Gunn, Columbia University. “Children and families are embedded in neighborhoods; poor neighborhoods differ structurally from wealthier neighborhoods, with fewer safe and natural places to play and exercise, fewer supermarkets and more fast food,” Evans explains. For their study, the researchers analyzed demographic factors and changes in body mass index (BMI) from ages 2 to 6 1/2 for nearly 1,000 children born with low birth weight. In typically developing children, BMI increases during the first year, then declines to a low point before increasing again in what is called adiposity rebound, usually between the ages of 5 and 7. Children who rapidly gain weight early in their first year or who have an early rebound are at risk for obesity throughout life. Because they tend to gain weight more rapidly over their first two years to “catch up” with normal birth weight infants, low birth weight infants face higher risks for obesity, but being poor, a minority or living in poor neighborhoods adds to their disadvantage, the authors say. Evans and colleagues found that the low birth weight toddlers from poor families already had higher BMIs than their wealthier counterparts by age 2, at which point the harmful effects of living in an impoverished neighborhood took over. The children in poor and near poor neighborhoods reached adiposity rebound more quickly, and their BMIs increased more rapidly compared to children from non-poor neighborhoods. The team also found that African-American toddlers displayed an earlier adiposity rebound and greater subsequent BMI increases over time compared to Anglo-American toddlers. Hispanic-American children, on the other hand, had an atypical pattern in which their BMI increased steadily from birth, without exhibiting a decrease and rebound. “Health disparities emerge early and shape lifelong health,” Evans says. “Interventions need to address both the fundamental risk factors for pediatric obesity, such as poverty, chaotic living conditions and low parental education, as well as the mechanisms that appear to convey these risks, such as restricted access to healthy food, few safe and natural places to play, too much fast food, child food marketing and high levels of chronic stress, he concludes. The study, “Poverty, ethnicity and risk of obesity among low birth weight infants,” was supported in part by the Stanford Center for Poverty and Inequality. Posted in Features and tagged child development, obesity, poverty on July 24, 2014 by ktb1@cornell.edu. The more ongoing stress children are exposed to, the greater the odds they will become obese by adolescence, reports Cornell environmental psychologist Gary Evans in the journal Pediatrics (129:1). Nine-year-old children who were chronically exposed to such stressors as poverty, crowded housing and family turmoil gain more weight and were significantly heavier by age 13 than they would have been otherwise, the study found. The reason, Evans and his co-authors suggest, is that ongoing stress makes it tougher for children to control their behavior and emotions -- or self-regulate. That, in turn, can lead to obesity by their teen years. "These children are heavier, and they gain weight faster as they grow up. A very good predictor of adults' ability to follow healthy habits is their ability to self-regulate. It seems reasonable that the origins of that are probably in childhood. This [research] is starting to lay that out," said Evans, the Elizabeth Lee Vincent Professor of Human Ecology in the Departments of Design and Environmental Analysis and of Human Development in Cornell's College of Human Ecology. Evans conducted the study with former students Thomas Fuller-Rowell, Ph.D. '10, now a Robert Wood Johnson postdoctoral fellow at the University of Wisconsin-Madison, and Stacey Doan, Ph.D. '10, an assistant professor of psychology at Boston University. The researchers measured the height and weight of 244 9-year-olds in rural New York state and calculated their various physical and psycho-social stressors -- for example, exposure to violence, living in a substandard house or having no access to such resources as books. They also measured the children's ability to delay gratification by offering them a choice between waiting for a large plate of candy versus having a medium plate immediately. The researchers measured the children's height and weight again four years later. While the study doesn't prove that a child's inability to delay gratification causes her to gain weight, there's strong evidence to suggest that it does, Evans said. First, previous studies have shown that chronic stress is linked to weight gain in children and teenagers, and that children eat more sugary, fatty foods when stressed. Second, there's a plausible neurocognitive mechanism that may help better understand this behavior, Evans said. "There's some evidence that parts of the brain that are vulnerable and sensitive to stress, particularly early in life, are some of the same parts involved in this self-regulatory behavior." The study has implications for education policies such as No Child Left Behind that emphasize testing cognitive abilities but ignore children's ability to control their behavior and emotions, Evans said. "A child's ability to self-regulate is not just predictive of things like whether you're going to have trouble with weight -- it predicts grades, graduating from high school. A 4-year-old's ability to self-regulate even predicts SAT scores. This is a very powerful phenomenon," he said. The findings also have implications for interventions and policies aimed at reducing individual stressors. "If it's the cumulative impact of stress on these families that is important, that means an intervention that only looks at one stressor -- say, just drug abuse, which is how most interventions are designed -- is doomed to fail," Evans concluded. The research was supported by the W.T. Grant Foundation, the John D. and Catherine T. Mac Arthur Foundation, Network on Socioeconomic Status and Health and the Robert Wood Johnson Foundation. Posted in Features and tagged cognitive development, obesity, stress on February 27, 2012 by ktb1@cornell.edu. Through a novel alliance with local churches and health clinics, a multidisciplinary team of Human Ecology and Weill Cornell investigators are striving to reverse the odds and reduce obesity and obesityrelated deaths in black and Latino adults in Harlem and the South Bronx. For two years running, the Bronx has attained an unwelcome distinction: the unhealthiest of all 62 counties in New York. High rates of adult and childhood obesity, especially in the South Bronx, have helped plunge the borough to the bottom of the findings by the Robert Wood Johnson Foundation and the University of Wisconsin Population Health Institute. A few miles west, across the Harlem River, the proportion of overweight and obese residents in Central and East Harlem is similarly high—about 6 in 10 adults and more than 4 in 10 children. As a result, these low-income neighborhoods, largely African American and Latino, show disproportionately high rates of hypertension, heart disease, stroke, diabetes, and a host of other chronic health conditions related to poor diets and sedentary lifestyles. Perhaps most distressing, however, are the environmental, cultural, and economic influences that promote obesity in these neighborhoods: a surplus of fast food restaurants and a shortage of fresh produce and other healthy options; limited access to parks and affordable recreation; and unusual work, family, and social strains. 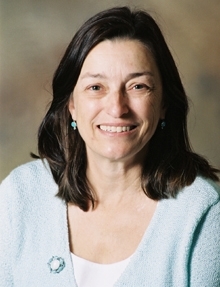 Posted in Articles on the Web and tagged obesity on July 25, 2011 by ktb1@cornell.edu.